Sometimes the home video release schedule leaves me feeling a little like Mother Hubbard. This week, the cupboard is pretty bare! So rather than tell you about a movie I’m not very excited about, I’ll tell you about one you likely wouldn’t hear about otherwise. It was recently added to the Amazon Prime library, and if you like small, thoughtful movies it’s worth seeing. Personally, I don’t like knowing too much about films before I see them—but once I do see them, I like to be able to find out as much about them as my interest warrants. Corbin Bersen’s Rust is one of those where, having seen the film, I just wanted to dig and dig and dig and dig. What I found was that the story behind the film was just as interesting—maybe even more so—than the film itself. This is an indie film to end all indie films, so the expectations start there. And you may be taken aback when the film starts. With little to no preamble, the camera closes in on director/star Corbin Bernsen’s eyes as he faces an off-camera presence. He’s in a church, and he’s confessing—no, accusingly lamenting—his loss of faith. And from there Bernsen’s character emerges into a harshly beautiful and pure winter landscape… and the midst of a nagging mystery. Bernsen plays Jimmy, a small-town Saskatchewan high school hero who outgrew the town and, after a fashion, ran away to become a minister. When his pastorate falls apart, he comes back to town—just in time to discover that his childhood best friend Travis, developmentally disabled, has confessed to an arson that killed an entire family. The community wants to move on, but Jimmy feels that something just isn’t quite right. As he ferrets out the truth, he also confronts the parochial dynamics of the community and his family—friends who can’t forgive him for going away, or for coming back; a father who has never wanted much to do with his son; and a sister who can’t abide Jimmy’s friendship with her ex-husband. It’s too small a town for too much drama. In Rust—an agrarian term for an insidious fungus that can destroy an entire crop of wheat if left unchecked—Corbin Bernsen has crafted an absorbingly human mystery… and at the center of it is, perhaps, a once-in-a-lifetime performance from Lloyd Allen Warner as Travis. You will not soon forget the intensity of his jailhouse-interview scenes with Bernsen, nor his tortured visage as a farmhouse burns to the ground behind him. So here’s the deal. Rust is not only absorbingly human because of Jimmy’s passion for Travis, faith, and justice; it’s absorbingly human because of the way Bernsen made the film, too. You may have heard about Kyle MacDonald, and his project back in 2005 to trade his way from a red paperclip all the way up to a house. 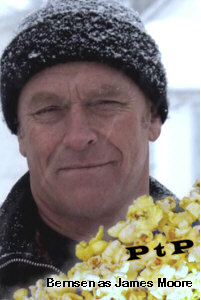 Bernsen came into the picture when he offered to trade a role in his film Donna on Demand for MacDonald’s up-traded snow globe. The town of Kipling, Saskatchewan then traded the coveted house for Bernsen’s film role—and after casting Kipling local Nolan Hubbard in Demand, Bernsen was so taken by the town and its residents that he offered to return and make an entire movie there… if Kipling would pony up and raise the financing themselves. When Kipling came through with a couple hundred individual $1000 investments, the deal was on—and Bernsen custom-wrote Rust for Kipling and cast almost the entire movie from its residents. It’s a remarkable story you might try digging up on YouTube. And you won’t believe what you learn about Mr. Warner. Yes, the conclusion to Rust is somewhat forced. But if the future of indie filmmaking looks an awful lot like Rust… well, that wouldn’t be such a bad thing. Rust is include with Amazon Prime and is also available to rent on YouTube.